Sometimes the simplest things work the best. Researchers at Cornell, University of Chicago and iRobot (the Roomba folks) have created a robot gripper that is made with ground coffee and a latex balloon. 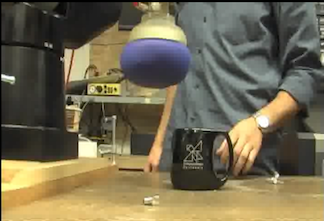 Basically, they vacuum air out of the coffee filled balloon and the structure inside becomes rigid. Let air in, and the structure relaxes. Think of how hard a brick of coffee is, and what it’s like after you cut through the vacuum packing. The balloon presses into the object that they want to grip, vacuum out the air, and the balloon and coffee grip the object. A very inexpensive solution to a problem many people have been working on for a long time. Check out the details and video at Physorg.com.